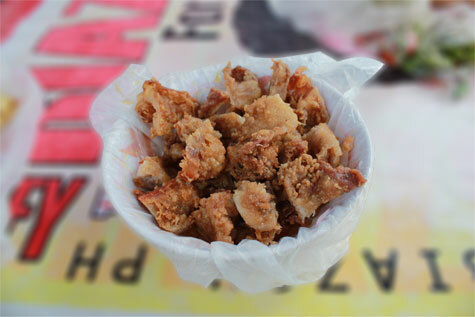 Ginabot is the Visayan term for Chicharon Bulaklak. It is made from pig’s intestines, salted, and deep fried to a crisp that resembles a flowery appearance – a crispy flower-shaped finger food. A finger food. A street food. My food. This becomes part of my low-budget meal. The pungko-pungko stall, literally means eating while squatting, however has wooden bench, is found in the basketball court near IT-Park along Salinas Drive. But the one I usually go to is situated in front of the Waterfront Hotel – Cebu, I mean right beside the main road going to the hotel. There is one stall in the corner of Salinas Drive and the entrance road of Waterfront Hotel. There are other finger foods like ngohiong, lumpia, and longganisa are being served as well. Along with the puso, a rice wrapped and cooked in coconut young leaves. And to complete the meal, Sparkle soft drink is also available. For just PhP9.00, you can enjoy a full meal with the ginabot + puso + Sparkle. Because of its low price yet satisfying value, there’s no question as to why there are diners that continue to eat ginabot in pungko-pungko stall. One can burped out – “I’m solved!”. But the question is: Is this a food for no gallbladder? Or a food to avoid for persons without gallbladder? Despite its calories and saturated fat content, my system take it normally without having problems – no diarrhea, no stomach pain. I can say that I am okey to eat ginabot. Great article with very interesting information. Hmmm…very cheap pero di na ata kasama sa P9 ang sparkle kasi sparkle pa lang eh P9 na. Street foods will always have a place for the Filipinos as we all love them even some wealthy people also love the food adventure.